John Stones has enjoyed a meteoric rise in his career to date, making his professional debut for Barnsley as an 18-year-old, completing a £3 million transfer to Everton and impressively featuring for the Toffees in the summer friendly against Italian giants Juventus, all inside an incredible 18 months for the Yorkshire born England u20 international. Few outside of Oakwell and Goodison Park will have heard about John Stones, but the 6 foot 2 inch defender is building quite a reputation for himself. Equally comfortable at right or centre back, it is probably in the middle of the park where he will establish himself due to his frame and build. Stones has an incredible calmness about his play, which was more than evident in the friendly against Juventus where he comfortably fitted in alongside Jagielka and Distin to mark both Carlos Tevez and Fernando Llorente out of the game. He then calmly scored a delicately chipped penalty in the ensuing penalty shoot-out, more than impressive for a 19-year-old who is yet to feature in the Premier League. Stones joined his hometown club aged just 7 and went on to represent Barnsley through every age group and onto the first team, making 28 appearances for the club before David Moyes decided to bring him to Everton. He made his debut towards the end of the season, coming on as a second half substitute in his sides 4-0 Championship defeat to Reading. He did play one further game that season and was unfortunate not to score as the Tykes drew 0-0 with Brighton. 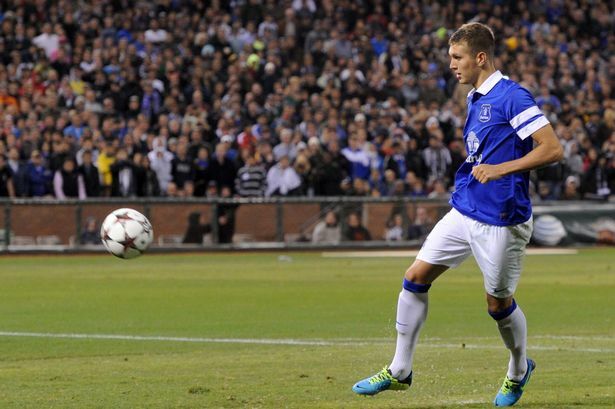 The following year Stones established himself as a first team regular, appearing 24 times in all competitions, before he secured his transfer to Goodison Park. By that time he had already impressed a number of opposition managers and scouts from across the Premier League were regulars at Oakwell. Chelsea, Manchester City and Sunderland watched the young Stones on a number of occasions, but it was Roberto Martinez and Wigan who made the first move, finally agreeing a fee with the Yorkshire outfit on the final day of the January 2013 transfer window. Stones looked set to make the move to Wigan, but a last-minute offer by Everton swung the decision and Stones decided to make the move to Merseyside. Barnsley were sorry to see him leave, with manager David Flitcroft telling the Barnsley Chronicle that he believed the club had just lost the best young defender in the country. “To be honest, I am numb. It is like losing a member of your own family. “I was asked if I could ­replace him, and the ­answer was ‘No.’ How do you ­replace the best young ­defender in England? Stones is so highly thought of at Barnsley that the club have renamed the clubs gym in honour of the local boy. Flitcroft hopes that the John Stones Fitness Suite will help inspire the clubs youngsters to progress to the first team and make an impact to rival Stones. Stones has made a quicker than expected impact at Goodison and has already impressed his teammates, with Tim Howard explaining to the Liverpool Echo that he is expecting big things from the Everton youngster. “I like Stonesy, he’s a good kid who takes information on board well. You can yell at him and give him a dressing down and he takes it and responds well. You need that as a centre half and I thought he was classy and composed tonight. “You buy a 19-year-old to look towards the future but he’s grown and got comfortable with the place. One game doesn’t make you a superstar and he’s got a lot of work to do, but tonight was a step in the right direction.